The Balinese people have four names. Wayan, Made, Nyoman and Ketut. Sometimes Wayan will choose to be called Puta, Made can also go by Kadek and Nyoman, Komang. But Ketut is always Ketut. If there is a fifth child it starts all over, and he or she will be Wayan or Puta. It’s simple really, and very convenient when meeting people. I sometimes wish that the Balinese culture was this simple. Bali is a ceremonious land and everything is celebrated. Ceremonies are held before birth, after birth (literally to bury the afterbirth with offerings), the first time a baby touches the ground (this is 210 days after birth) the tooth filling ceremony, puberty, marriage and of course, the cremation. Ceremonies are loud, colourful and energetic. The cremation ceremony is likely one of the most recognized and interesting to attend if in Bali. Women adorn themselves with fruit and flowers, offerings are made and sometimes men will make a sacrifice through a cockfight and there is always a musical accompaniment. Cremations are expensive and sometimes not affordable at the time of death, so the deceased will be temporarily buried (sometimes for years). At the time of cremation, the body will be carried by men in a three tier tower made of bamboo and paper and everything colourful you can imagine. How many men carry the body is dependent on the importance of the deceased. The transport of the body can be anything but steady as it is very important the spirit does not find its way back to the home. I’ve been told that lost spirits can be a ‘real nuisance.’ To prevent this, the carriers of the body will shake and spin the tower many times on the way to the cremation. The body will be put into a sarcophagus – a bull for Brahmana, a winged lion for a Satria and a sort of elephant-fish for a Sudra. It is the eldest son’s responsibility to sort the ashes to make sure that there is no body left after the burning. In my reading, it is believed that after death you go to a paradise – exactly like Bali. I met Gede three years ago this May. It was a long search to find a metal smith in Bali (although being the land of craftsmen and artisans one may think said search would be quite easy). It wasn’t. I traveled from Kuta to the Gianyar Regency of Bali in search of a talented craftsmen for some designs I had put together thinking that I would find some able hands in Celuk, the area that most silversmiths reside. The search turned into days with no luck. It was by chance that I met Michelle, a fellow Canadian who was in Ubud learning Balinese massage. It was Wayan, a young a social Balinese man with dreadlocks to his waist that worked at the local Rasta bar that introduced us. Michelle was studying and exchanging practice techniques with Adi, a local spa manager that had an interest in learning Swedish and Thai massage (Michelle’s specialty) and the three of us quickly became friends. It started pouring rain shortly after our introduction and so we quickly moved inside to the Jamaican themed bar and began exchanging stories. I told Adi about my unsuccessful search, to which he had a promising reply. He tells me his brother is a silversmith in Denpasar and offers to take me the following morning. Although sceptical, I agree, and so Saturday morning Michelle, Adi and I along in a rented car are off to the big city. Gede’s home is large by Balinese standards, and is gated. His workshop is on his premises and behind the sliding driveway gate all employees’ line up their motorbikes. There must be 30 of them. Gede is humble and quiet. He is very generous and soft spoken. He feeds us water and coffee and takes us on a tour of his home. Its lunch time when we arrive and the whole compound smells of rich spices and delicious curries. We sit and talk for a while. I learn he was a long time employee of John Hardy, a renowned Canadian jewellery designer that also resides in Bali. His work displays focus, talent and quality. By this time I’ve toured many Balinese silversmith operations but none as friendly and open as here. Gede and I arrange to meet again. He is going to produce samples of my designs and from there we can organize our business arrangement. Three years later, arriving in Bali, Gede is one of the people I am most excited to see. He tells me he has long awaited my return and so our confusion of meeting times and days quickly become irrelevant. 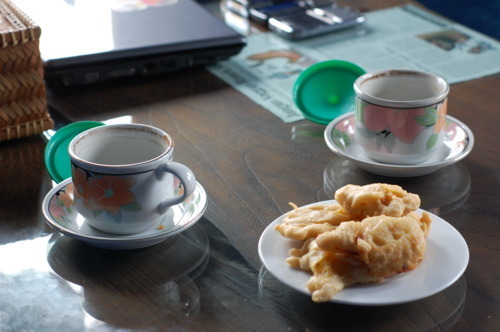 We are finally enjoying coffee and banana pastries together in his ever expanding home, listening to the numerous pet birds that he has on his front veranda and talking about business. I’ve asked Gede to make a small but very important component to attach to all strands and bracelets I will make. A very simple ‘Kaviar’ charm, both in Silver, and Gold. We are both excited to meet again, and so an hour and half together isn’t quite enough. Gede is confused (as every Balinese person is) that I don’t know where I’m going next. In Bali, you must always have a plan; always know where you are going and most importantly, how you are getting there. Gede has one of the most important ceremonies of all tomorrow – the cremation ceremony. He catches me off guard when he corrects me – it is like the cremation ceremony, but the person is still alive. He invites me to spend the afternoon with him, and of course, I’m eager to do so. Our first stop is to see Wayan. (A different Wayan than dreadlock Wayan) We drive one hour and a half to the Bangli Regency of Bali, probably the most beautiful area I have seen yet. We can only go so far in Gede’s Toyota 4×4 and need to get out and walk for 5 or 6 minutes to get to Wayan’s home. He is waiting outside for us barefoot in a red t-shirt and black short shorts. He has reflective eye glasses on. Gede tells me that Wayan’s eye sight is very poor and is instructed to wear these until his eye is healed. He got a cigarette in the eye while playing volleyball. (I know it seems a bit bizarre to be smoking while playing an athletic sport, but in Bali, it seems anything goes). Wayan is a master carver, and any engraving or detail for silversmithing is always carved of wax first. Thailand is one of the leaders in machine moulds, but in Bali it is done traditionally, and Wayan is one of the best. We are invited into his yard where Gede and I sit and smile at the dozen kids that surround us while one eyed Wayan jets off on his motorbike to get beer for our meeting. He promptly returns so we flip our shoes off (as you do in any Balinese home) and make ourselves comfortable on the Persian rug that lay’s atop the cold tile floor. Wayan pops open three Bintang’s and we begin drawing and measuring the size of my charm. Business is short and conversation quickly turns to beer, Arak (a Balinese brewed alcohol) and Canadian weather. Without pictures of the snow, it is difficult to explain. Back in the Toyota and a quick U-Turn later, we are en route. Next stop, I am very pleased to learn is Mangku Tedja. Gede refers to him as his ‘Teacher’, but his name is carved on a sign that sits boldly outside the entrance way. Aside from my knowledge of Balinese healers made famous by Elizabeth Gilbert’s Eat Pray Love, I have researched who these people are and what they do. A Balian can be referred to in many ways, but a general description is a spiritual guide, or healer. There are 4 main types of Balian’s, Ketut Liyer, who both Elizabeth Gilbert and Julia Roberts visit throughout their 4 month stay is a healer that knows the past, can see the future and will listen to the spirits to help guide. Some healers sort energies, guide spirits, heal through massage (very painful, and you might squeal) and help work through troubles and pain. Not all can see the future, and I am guessing the Balian’s abilities are determined by their seniority in the spirit world. (I do not know this for a fact, it is only a guess based on what I am about to tell you) Visits to Balian’s have become increasingly popular with tourists since the publishing of Elizabeth Gilbert’s novel, and because a Balian will never refuse anyone, it is now advised to not see a Balian for a superficial or unnecessary reason as you may be taking time from someone who truly requires the healing powers of the spirit world. Mangku Tedja is 85. His hair and beard white, small and frail although appearing strong at the same time. He smiles wide when we are introduced, all of his gold teeth showing. It is in Mangku Tedja honour that tomorrow’s ceremony will be held. In every village you see men just ‘hanging around.’ Mangku Tedja’s shrine is surrounded by many men in sarong’s with Bintang or Angung auto mall t-shirts much like any other village street. I’m immediately served a Balinese coffee with sweets and the men are eager to start testing the sound system and speaker that Gede has brought for tomorrow’s ceremony. Gede leaves for a short while to take the priest back to her home and so I wait, leaning on Mangku Tedja’s shrine, sipping my coffee and listening to the dress rehearsal speeches and prayer for tomorrow. At this point I’m not entirely sure how tomorrow’s ‘cremation’ ceremony works. Mangku Tedja is right in front of me – As strong as any 85 year old, dangling his flip flop from his crossed leg, slowly smoking his clove scented cigarette, listening to what any north American would assume, his eulogy. Confused? Backwards? The whole village is there, planning, preparing, beating rugs….. The whole while, I’m sitting observing. Everything is traditional…. everything except the stethoscope that is hanging from the same hook as the Balinese calendar. In between talking over the loud speaker I’m asked where Canada is, and if I know that Obama is Indonesian – From Java actually. No. I didn’t know this. I have no doubt Obama’s Indonesian language skills are exquisite. My religion is also very important. It doesn’t matter what religion I follow really, as long as I believe in something. I’m told that all our Gods are the same. There is one, and there are many names, but the higher power is the higher power. Period. A major point of conversation? Japan. I’ve got a bit to think about, countless questions and A LOT to Google. Gede arrives back, quickly gulps down his coffee, and we say our goodbyes. I didn’t know if I should wish Mangku Tedja good luck tomorrow, so I expressed my gratitude for meeting me and the coffee and we were off. As for what tomorrow’s ceremony is all about, this is the breakdown. Mangku Tedja will meditate for 12 hours. During these 12 hours, he will slip into a state of unconsciousness, the same as if he were dead. It is required of him to let his spirit go and battle other spirits in the spirit world. If he wins, he will come back alive and will be recognized (I believe) in a more graduated and top-ranking state of spiritual leadership. If he is defeated, he will die. Immediately I assumed that the stethoscope is to measure Mangku Tedja’s heartbeat throughout meditation, or, after the 12 hours. False Kristin. False. They used the stethoscope yesterday. Tomorrow there will be no measurement of the Teacher’s meditative state. I suppose the outcome will be clear after 12 hours. Apparently not all come out alive. Today has been a huge honour and a wonderful success. Upon waking this morning there was a quote on my facebook page that read “When you feel like giving up remember why you held on so long in the first place.” I’ve never felt like giving up, but sometimes we need a reminder and refreshing inspiration to keep growing. 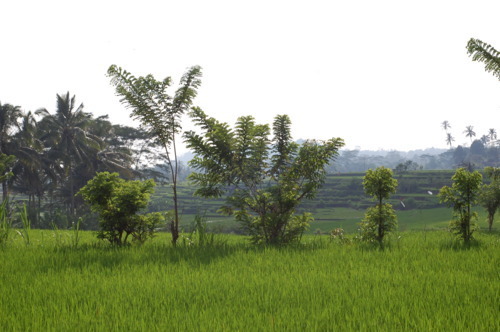 Bali is a beautiful and bountiful land that for some reason, has called my name. Aside from being home to an environment and advancements in aqua-culture that produce some of the most spectacular pearls in the world, it is also the land that continually inspires and recharges my spirit. A conversation had today, and many times over the last few months, I’ve learned that a satisfied spirit is as equally important and necessary as my pearls and my work.